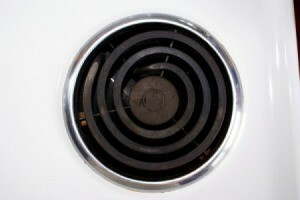 If one or more burners on your electric stove stops working, you may be able to troubleshoot the cause yourself. This is a guide about electric stove burners not working. I have a Hotpoint electric stove that was working, but just stopped. I went and got another stove and plugged it in and it is not working neither. I checked all the wiring and burners on the stoves with a multimeter and everything seems to be good on both stoves, but when I plug either one in they turn on, but are not heating up. Any idea what it can be? 4 burners on my GE electric stove do not work, but the oven and clock work. Make sure the burners are making a connection Check your breakers. Either you have a fuse burned out OR you have the type of burners that plug and unplug. If they are the type that pull out, replace them. It would help if you could show us a photo of your stove top. Check circuit breakers/fuses and power cord. What would make my electric burners just blow? Could it possibly be from spraying them with cleaning chemicals while cleaning? It's always possible that using a spray cleaner could have caused all of your burners to fail but it's much more likely that you have a broken wire breaking the electrical circuit to your burners. The wire(s) could be broken due to age, or it could be the break has occurred from the motion of lifting the burners to get to the area beneath if your stovetop is so designed. This is a job for a professional. You're looking for an appliance repairman/woman who carries bonding and insurance, and holds specialised training in electric appliance repair. Pricey, yes, but safest option for you and anyone living in the home. Have you checked the breaker box? I have a separate stove and oven and they are on separate breakers. The 4 burners quit working. I replaced the breaker and still nothing. What should I do next? It sounds as though you have a wire gone bad in the stovetop (the part where the burners are). It may be something as simple as a loose wire from the top being pulled up while cleaning. Shut off the power to the burners and then use a flashlight to get a good look at the wiring to the burners-you will see the wiring leading to each burner, plus a main feed into the wall where the burner feeds into a junction. Even if you find the wire, though, you should leave a job like this to a professional-preferably one factory trained on your model cooker. It may be expensive but it's worth it when you consider the fire hazard factor.